It's different, stylish and functional. I also think it's the perfect gift for a baby shower or Christmas gift for a new mom. These are made by The Magic Stroller Bag. Unfortunately, they are located in Paris and you can't order them on their site. But, there are other stores that sell them. The price ranges from $150 - $400, depending on the site that sells them. So shop around if you are interested! What a fantastic gift for a new mom or mother to be. Wish they'd had something that stylish and practical when mine were little! that is so nice! I guess it's somewhat justifiable because you will have to use it for at least a year and a bit...and it looks good enough to use beyond that! oh wow! now why didnt they have that kinda stuff when my kids were babies! so chic! Great bag. Never say one with wholes for stroller.And it is so stylish. Oh how intriguing! 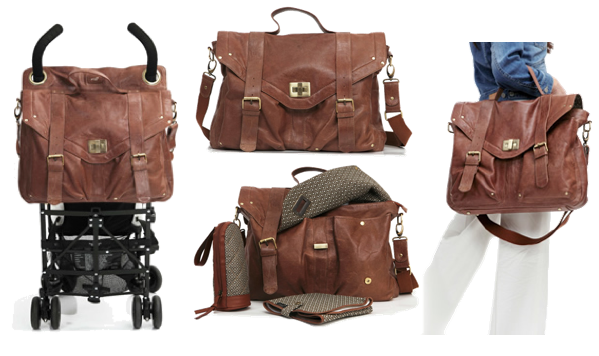 It's such a handsome bag...and sophisticated for a baby bag! Oh wow! That is a gorgeous bag...I don't have kids yet, but I would love this bag now. :) Great gift idea. They are for the polished, sophisticated mommies that's for sure! Graceful gift for moms..Moms are so much more powerful than they realize. How they are feeling on a particular day can have significant effects on the entire family. A Mom can and does influence so many things in her environment. And that can affect how she feels, and in turn how the other family members feel. I would have loved to have had a bag like that! I guess I still would love one! NICE! I'm having troublle finding where to purchase them... Any help? ?